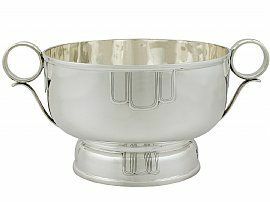 This exceptional vintage George VI sterling silver bowl has an circular, rounded form to a domed foot. The surface of this Walker & Hall silver bowl is plain and embellished with four impressive iconic Art Deco lobed motifs to the upper portion. The upper rim of this bowl is encircled with an applied moulded border to the rim. 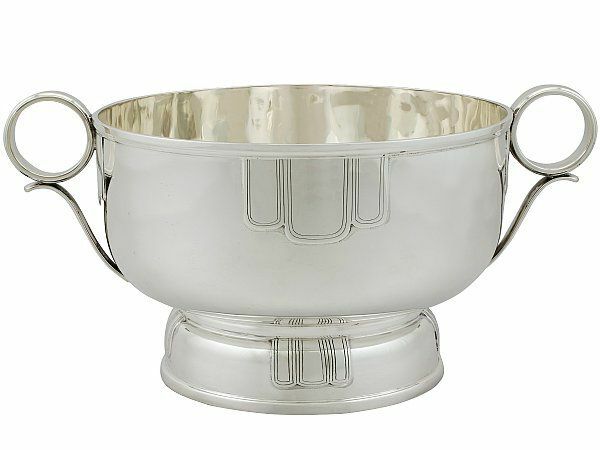 This impressive vintage silver bowl is fitted with a pair of handles ornamented with an circular handpiece accented with a swept bracket support. The domed foot is embellished with further applied iconic Art Deco motifs, reflecting that of the body. The underside of this impressive piece bears the retailer's mark 'Walker & Hall, Sheffield', in addition to the registration number '52506'. This vintage Walker & Hall silver bowl is an exceptional gauge of silver, exceptional quality and in exceptional condition.